When my mother and I returned at the same time from India last year, I expected that to be her one trip there and that I would end - at least for a while - on a round forty visits. Apparently not. Mother wanted to go again. Off we went therefore a week later than last year to take on Calcutta, Varanasi and Lucknow before a brief visit to Delhi. Mum, watching the news for temperatures in all the places, commented that Calcutta was around 36 degrees. It seemed unduly high so I disregarded it imagining it to be a mistake. It was but not by much. We spent the night before our Emirates flight to Dubai in the Gatwick Travelodge and were at the airport reasonably early the following morning in the hope of securing better seats. I was given an emergency exit seat but Mum was a whopping thirty-four rows in front of me due to the situation of who can sit in the emergency exit rows. It was not ideal. The flight was fine and pretty much on time into Dubai where we spent the night. 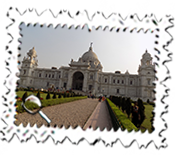 We find it better to break the journey but recent baggage changes meant that our luggage had to be tagged through to Calcutta and we could not have it in Dubai. There may be good reasons for it but it, along with the seating arrangements, makes flying at times more painful and awkward than it surely should be. We put up in the Mariana Hotel which was in a good position and fine other than a dispute over the breakfast which we had booked and which had been clearly confirmed. The hotel relented having been given duff information from the hotel booking company but I was surprised a couple of days later to receive an email from the company asking if we had stayed there as the hotel claimed that we had been no-shows. Bizarre. There was no rush the following morning as our flight to Calcutta was not until 1:15 p.m. We made arrangements for legroom seats whilst sitting reasonably close together but somehow Emirates managed to get it spectacularly wrong and we ended up apart, in middle seats and six rows back. If nothing else, I learnt that my 6'5 inch frame can just cope without great discomfort in the space provided in such seats. 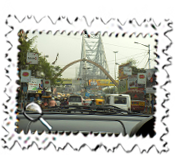 We had booked into the Silverline Hotel close to Calcutta Airport as they would meet us and take us to the hotel. Unfortunately, it seemed that they were not there when we arrived after a long wait to be finally reunited with our bags. 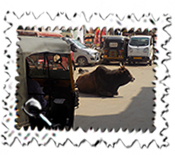 It meant that the best of India was afforded to us by helpful people offering their services the best one being a man who told us that the Silverline had burned down and that he knew another place where we could stay... We declined his offer. Anyway, we did eventually meet up with the hotel driver and were unsurprised to find that the hotel was still intact. Oh dear, my first full day in Calcutta appeared to start with my worst nightmare. Unable to raise Mum after first knocking and then banging on her door, I took to the telephone but again without success. I was not at that stage aware of cameras along the corridor but, in any event, it would not have stopped me shoulder-barging the door and, to my surprise, it yielded. A little remedial work was later required although there had been no damage but I was relieved to see Mum stir. She blamed a wax muffle in her ear and found it uproariously funny. I wish I had been able to do the same. We had booked a car and driver for the following two days through Savaari. They had been very helpful and efficient and booking in advance had saved time the next day in finding a company which would give us the standard 8 hour and 80 kilometres package. Unfortunately, the clause that stated that the mileage starts from the Savaari depot allowed far too much freedom for driver creativity. I had checked on the distance in advance and been told 15 kilometres each way but our man on the first day was not only late but insisted that the return mileage to the depot had been a whopping 75 kilometres which led inevitably to a dispute. It was lowered but was far from correct and the same happened, to a lesser degree, on the second day. 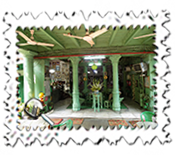 When we did eventually move, we went to one of the Kali Temples, Dakshineswar, on the banks of the River Hooghly. We wondered why the driver needed to cross the river and then take us to the Temple which we had previously been close to on the other side of the river but had to put it down - and also parking bills which did not add up - to further creativity with the final bill. 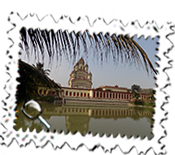 Dakshineswar is a serene place but busy and photos were only allowed outside the main temple area. 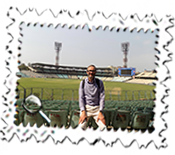 We moved on to the centre via the impressive Howrah Bridge and stopped at what used to be one of the world's largest cricket grounds, Eden Gardens. I was keen to go in but met a brick wall in the form of the man on the gate. It is never easy to enter an Indian ground when there is no match on but, for once, my persuasion paid off and the chap relented and we were given a quick tour for which we were grateful. We were allowed to take lunch at the remarkable Fairlawn Hotel, a type of Raj relic and what was a bastion of Britishness. It is an oasis of calm amidst the hubbub of slight chaos outside on Sudder Street. We had a nice lunch but had to return later to pay an outstanding amount, there being no change available at the time. The Fairlawn appeared in the film City of Joy and framed photos of letters from the book's author, Dominique Lapierre, to the hotel's previous owner, Violette Smith, adorn the walls. Photos also immortalise Mother Teresa and Felicity Kendall on the walls, the latter I believe having a connection with the hotel. Changing money threw up another anomaly. £20 notes attracted a rate of 89 Rupees to the pound but only 86 was given for a £10 note. I went elsewhere the next day and haggled my way to 89 for £10 notes. Mum, unused to some of the financial creativity used, regularly told me off and walked off being apparently unable to bear the thought of her son haggling. Actually, I rather enjoyed most of it and, later during the trip in Lucknow, was delighted when an amicable exchange over a fair rate for an autorickshaw was interrupted by the hotel manager coming out and asking if there was a problem. The price I had insisted upon was duly granted and was a third of the asking price. Our second full day in Calcutta saw us firstly visit The Mother House, the mission where the tomb of the late Mother Teresa is housed. 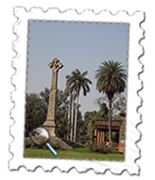 Her work continues to Calcutta's poor and destitute and the sisters were charming giving visitors a memento of their visit and a prayer card. It was a moving experience. Years ago, after a flight to Calcutta, I had noticed a lot of security and looked round at the right time to see Mother Teresa who I found out had been on the same flight. Another wonderful moment. 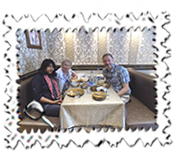 We visited my friend, Melvin De Doncker, in his pleasant flat nearby and he kindly took us out to lunch in a very pleasant restaurant in Park Circus, one of the main areas of Calcutta's centre. After a visit to the grand and impressive Victoria Memorial on the Maidan (where, inevitably, many games of cricket were taking place), we returned to the hotel and another battle over the car bill. Paying the bill in the hotel was no easy matter either. A reluctance to allow payment before 9:30 p.m. after four prior requests was then met by the news that the card machine did not work. In the end, I had to tell them that payment would not be made by cash and that, unless their machine worked, they would have to sort out some amicable way to settle the account. It soon burst into life. We moved on by Indigo flight the following morning to Varanasi and the flight was fine. if my choice of hotel in Calcutta had not possibly been my finest hour, the Surya in Varanasi most certainly was. I had high hopes for what looked like another Raj relic and indeed it was even better than that. I would rate it my second favourite hotel in India behind the similarly-styled Oberoi Maidens in Delhi. The staff were excellent and attentive and we were indeed upgraded because we had turned up early and they did not wish to keep us waiting. What a nice touch. The restaurant, in a separate building, was also excellent although I had finished my meal before Mum's Lasagne came along. Our rooms had nice views over the garden and, in short, everything was perfect about the Surya. We had one full day in Varanasi and did well. It had been the reason for Mum wishing to return and she saw a good deal (and a little more which had not been anticipated within the itinerary). We hired a hotel car and the driver was superb taking us firstly to the ghat (pronounced without the g) from where we took a half-hour boat ride (after much bargaining). Hindus bathe and wash their clothes in this holiest of rivers in the 5000-year-old city. Sadhus, men on a life's spiritual mission, are seen in their distinctive orange clothes and there is general chaos on the city's roads immediately behind the ghats. Mum, after enjoying the sight of a cow lying almost supine on a busy road, soon found herself rather closer to the same road having fallen foul of the road's unevenness and had fallen on her face. We had an antiseptic applied to a gash on her thumb at a local pharmacy (or, as they are sometimes known, druggist) but the driver insisted that we go to the local doctor to have it better attended to. The doctor was a trifle abrupt but quickly had the wound cleared up and administered a further tetanus jab as a precaution. All for one pound. Mum was soon fine and laughing again at it and I suspect later resented the helping hands of the driver and son fearing that she would wipe out again... Anyway, she remained upright. The hotel arranged a very reasonably-priced trip to the daily Ganga Aarti show held on the banks of the Ganga. It baffled me how a car only could cost twice as much earlier in the day and yet, in the evening, we had the same car and driver and an included trip on a boat for over an hour for half the price. Anyway, both were excellent value. We watched cricket and a very decent standard at that on one of the ghats. 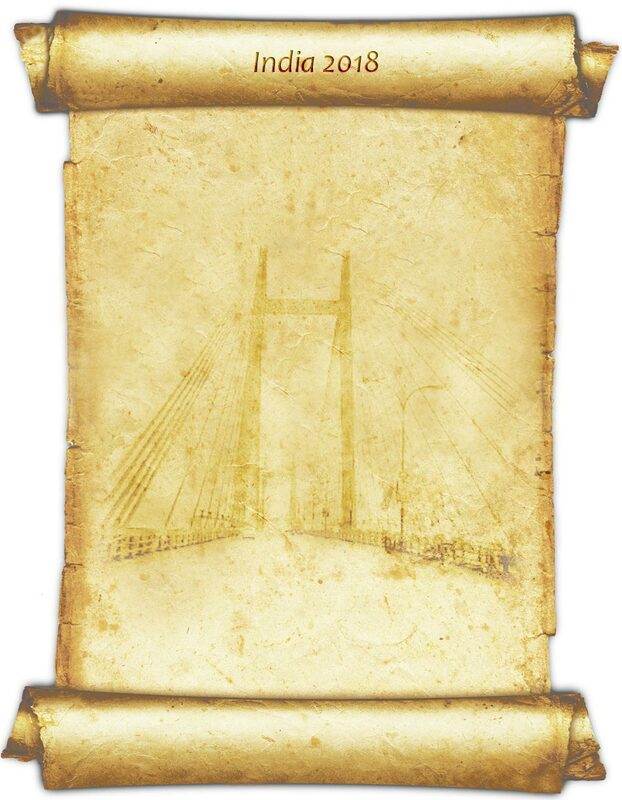 A good number of the attacking shots had to be retrieved from the holy river. Of more concern to me was a baby monkey which jumped on a couple of tourists, played with a dog and caused me untold misery. I am not ashamed to say, though, that I did not mind the locals laughing at my nervousness. Like dogs, I come out in a cold sweat at the prospect of a bite or scratch. When our boatman came, the wretched monkey jumped in the boat first before swimming ashore. After surviving Varanasi's streets, Mum was nervous about the boat going out without lights. The boatman was a boy of fifteen who spoke excellent English but had such a patter that he would interrupt and talk at such a pace that we were exhausted after five minutes! Coupled with a myriad of boats behind him, Mum wondered how on earth a collision was avoided. Being one who can sleep and switch off completely whilst being transported in any vehicle in India, I did not share the same concern but I accept that I may be alone in my feelings. Anyway, Mum said that her day in Varanasi had been fantastic. 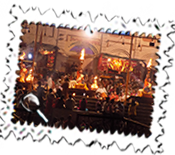 The Aarti, a devotional ritual using fire, is devoted to the Goddess Ganga and a candle and flower are floated in the river. It was most colourful and noisy and lasted forty-five minutes. Many, like us, watched from boats (also without lights) which afforded good views of the ceremony. We have left candles in many places for my late father yet our puja - an offering and in this case a flower, petals and candle arrangement in a floating case - was probably the most bizarre. I was slightly ashamed that my morning's puja capsized the moment I place it in the holy river. I suspect that my father, a seaman in his earlier days, might have been amused by my woeful efforts. The second remained upright in the evening and was last seen floating merrily down Ma Ganga. 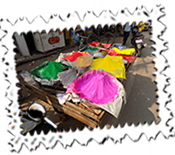 Holi, the festival of colours and the prelude to spring, was being celebrated across the country and stalls with vast bowls of paint were on display. 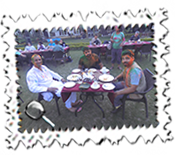 Some people play Holi seriously and paint themselves in many colours including green and orange, two of the three colours on the Indian flag. We were surprised to be visited early on our last morning by the housekeeping man who gleefully daubed us with green paint when our defences were down. Another highlight for Mum was a five-and-three-quarter hour train trip from Varanasi to Lucknow. We had berths on which we could lie down comfortably and which were welcome after finding that our carriage was the furthest away from our position on the crowded platform. We stayed in the Golden Tulip Hotel which is a business-style and slightly formal hotel. It was very comfortable and the staff helpful. People wondered why we went to Lucknow. 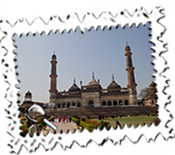 It was not just because my friend Pooja lives there but the city has much of interest including a vast Mosque, the Bara Imambara, and the Residency, the scene of the 1857 uprising. 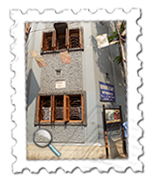 After our negotiations with the autorickshaw driver mentioned earlier, we went firstly to the Residency. It is one of my favourite areas in India. Its tranquillity makes it a favourite place for peace away from the hubbub of the centre and is now a far cry from events of just over 160 years ago. We went on to the impressive Bara Imbarara, a vast mosque. Like the Residency, tourists are charged ten times the amount that locals pay but it was money well spent. People might not have said as much but we suspected that my wide-brimmed, bright red Peruvian sunhat had many chuckling and we suddenly found ourselves mobbed by lots of people all wanting photos with us. This is not unusual in India but the volume of people that day was and we must have been photographed about forty times. Are things looking up? Am I indeed looking better? It was lovely meeting Pooja there and it was my turn to take photos of her and Mum near the mosque. We went on to a delightful restaurant where Pooja very kindly treated us to lunch. What is it called? Retail therapy? Well, in my case, I am far from being converted to shopping sprees but I did buy a kurta - a pyjama set - made from the distinctive chikan cotton peculiar to Lucknow. I expect that Mum walked away as I enjoy bargaining. We changed money too but the ladies had to disown me whilst I counted the British and Indian notes thoroughly and several times. I rather like the new £10 note but they do have a tendency to stick together making the counting operation imperative. I borrowed the cashier's calculator also to ensure that everything was as it should be (and was). The following day, we did some more shopping and bargaining at one of the local markets in Aminabad and met Pooja later in the day. Our last day meant a fairly early start as we wanted to visit the 4000-strong boarding school, La Martiniere College. Pooja had ordered us a Uber taxi and, despite some initial confusion as we asked for the route to be changed, Pooja quickly sorted it out by telephone and even called the driver to ensure that he had delivered us safely and subsequently at Lucknow Airport. Our visit to la Martiniere was interesting. 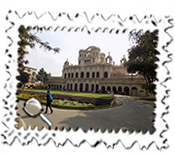 Nowadays, it seems very difficult even for former pupils to walk around their old schools without being challenged but, in Lucknow and at one of India's most famous boarding schools, we were not once asked what we were doing and could walk round freely and without hindrance. I had previously written to the college asking if we could give ourselves an unsupervised tour and they replied quickly saying that it was fine. Rudyard Kipling, born in India, based his novel Kim on La Martiniere College, I believe. We stayed once again in Pachim Vihar at the Neptune Residency and had a nice, convivial evening with Rajesh in his house. Our stay was only a short one in Delhi but was enjoyable and I had a massage in a nearby place the following morning before we left for the airport. We had much more success with seats on the flights back and had an enjoyable time. We met an amusing English group whose menfolk did their best to drink Emirates dry of their white wine. They were fun with it and were good company and completely sober. I have to admit that my one fear on a plane is having the middle seat and being surrounded by people who will only take a water or fruit juice whilst I enjoy gin and tonic and red wine, ordered at the same time out of necessity. We rather related to this English group without remotely trying to consume the amounts which they did. We had a two night stop in Dubai and put up in the Al Jawhara Metro Hotel which was conveniently situated near the Creek. 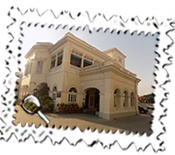 It was one of the friendliest places which we have stayed in and nothing was too much bother for the staff. The rooms were a good size and we found it an excellent choice. Our one full day in Dubai was most enjoyable. After taking one of the water boats, an abra (which we later discovered comes with lights unlike the smaller vessels in Varanasi), across the Creek, we looked in one of the markets but it was the equivalent of window shopping for me at least. 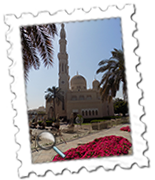 We took a taxi down to the main mosque, Jumeirah Mosque, but were slightly perplexed that the driver seemed unwilling to drop us off outside which would have given him extra money. Anyway, although visits are only allowed at 10 a.m. on days except Fridays and we were too late, we did enjoy at least seeing it. 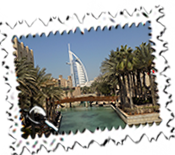 We moved on to Madinat Jumeirah which, with its labyrinth of canals and extraordinary views of the iconic Burj al Arab, is another vastly impressive hotel and had a nice lunch there. We did more window shopping in their souq and made excuses for not buying anything before taking the metro back to Union Metro Station having started the journey at the equally formidable Mall of the Emirates. We ate near the Creek after taking the metro rather than an abra. As mentioned earlier, Mum was pleased to see that the abras had lights and the view from the restaurant close to the water was wonderful. The choice of food was excellent and the meal was very nice too. 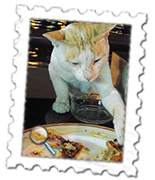 It was obviously a favourite haunt of a local cat which pestered Mum for her chicken and the cat's persuasion and sad eyes paid off as mother relented and the cat had an equally good meal too. We took the 12:10 p.m. flight from Dubai back to Heathrow the next day and it was surprisingly empty. We were allowed bulkhead seats together in the absence of any babies and had an enjoyable flight back. We saw plenty of the British countryside after the inevitable half-hour of circling and a taxi whisked us home quickly despite a vast amount of the M4 being subjected to roadworks. It had been another excellent trip.